If you could see this in its full color glory, it's actually very festive :). I used a combination of Inglot and MAC eyeshadows. It's not that hard to do yourself either! 2) Use that same fluffy brush and a matte eyeshadow close to your own skin tone to fade out the edges of the gold even further, using windshield wiper motions in the crease area. 3) Take a dense blending eyeshadow brush and pick a dark plum eyeshadow to deepen the look and add color. Start slowly building the color at the outer 'V' and gradually move inwards. Periodically use the fluffy blender brush (with no more product!) to keep everything soft and blended. 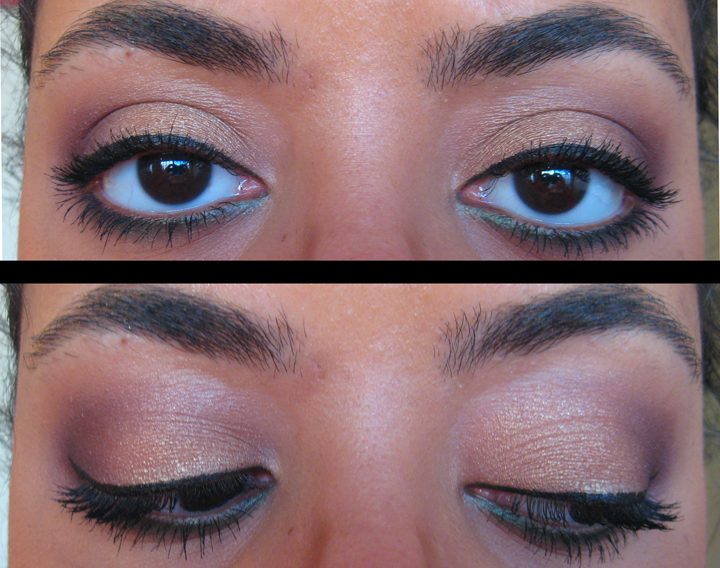 4) Line the bottom lash line with an emerald green eyeliner pencil. 5) Seal the liner by plashing a dark green eyeshadow on top. 6) Smoke out the bottom lash line by adding the plum eyeshadow just along the outer third. 7) Add liner and Mascara and THAT'S IT! I've got another fun eye look coming, a sparkly number I wore out Christmas Eve, and an OOTD! Stay tuned for more :D.